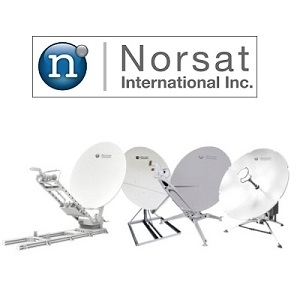 Norsat International has introduced four new satellite antennas for the Commercial satellite market. The WAYFARER series includes two ultra-portable commercial fly-away satellite terminals, an easy-to-deploy commercial drive-away antenna system and a commercial fixed terminal solution. Products in this series are ideal for a variety of commercial applications including broadcast, oil and gas, mining, forestry, emergency response and remote enterprises. Know and trusted for their rugged military-grade terminals, LNB's and BUC's, Norsat has applied its expertise to bring this new offering of high-performance and reliable commercial products. The WAYFARER series includes antennas that are both manual and auto-acquire and in multiple reflector sizes. For more information on the WAYFARER series, click here.